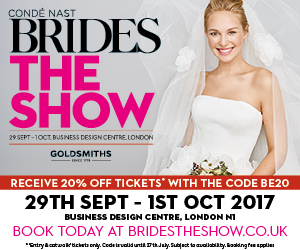 We are SO excited to have been selected to exhibit at this year’s Brides The Show exhibition. The show is a MUST for any discerning bride. The brides team has curated their favourite bridal experts who will be brimming with ideas on how to bring their expertise to your day. We’ll be showcasing our favourite weddings from the past year and will be on hand to discuss how our style of natural light wedding photography could work for you. You’ll leave feeling inspired, energised and armed with the skills to create your dream wedding day. AND….for any couples who book at the show we’ll be offering a special show discount on ALL wedding photo packages!
. Offer code BE20 will get you 20% off entry and catwalk tickets.